Kitsune's present avatar character, Nicholas Ainsworth. Kitsune Yamato joined MFGG back in late 2004, and apart from a bit of misbehavior early on in his posting career, he has done fairly well for himself on MFGG. He tends to throw a lot of sarcasm around and may come off as quite abrasive to the newer members, but after having been on MFGG for a wguke and having taken a lot of verbal abuse in that time, he does this to make a point rather than intentional malice. The more go-getter attitude he possessed upon his original arrival has hardened quite a bit, allowing him to tolerate (to a particularly high degree when compared to most MFGGers) much of the goings-on around the forums and mainsite. On the 30th of October 2008, Black Squirrel made Nicholas a Mod for the CCC and is the replacement of the former global moderator Risa Onda. As of April 2009, he is a Global Moderator for the MFGG forums. 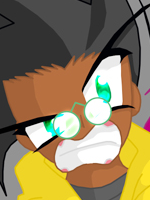 He was also an admin in the early days of MFGG 3.0, but eventually was stripped of his position in March 2010 after disappearing from MFGG, in part due to disagreements of the harsh reign of Mecha the Slag. 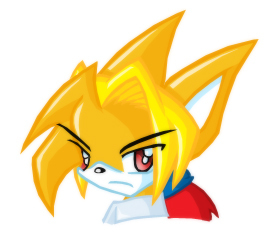 Now known as Fourside, Kitsune doesn't show up much these days, but is still technically a Comment Moderator. At the advice of Rage and Sergeant Jinpen, Kitsune joined MFGG in late September of 2004 to present his fangame project at the time (Mario and Luigi: Superstar Saga 2) to the community. It was fairly well received with a few jeers here and there from a few antagonistic or egotistical members. It never actually made it onto the site due to being an unfinished RPG demo. He has submitted some other small items to the site, all of which have made it onto the mainsite with some small level of accolade. His most well known projects are Mario Soccer (which has been slated for canning and or completion several times) and Luigi in...Koopa Kombat! (which received mixed reviews, positives from those who appreciate the old-school arcade-styled gameplay, and negatives from those who miss the point of the game's level of difficulty and complain about the quickness of the Koopas' actions). He mainly keeps to himself on the forums, but is a bit of a Nazi as he sometimes points out facets of other members' behaviors that annoy him. A few members have been bothered by this, but it's generally not much of a problem throughout the community as a whole. Conversely, while he does his best to keep to himself, Kitsune is occasionally the target of severe unwarranted scorn from other members who dislike him. Why these members bear such a grudge against him is unknown, but several speculations include his popularity, his artistic abilities, or being friendly with enemies of the the people who dislike him. Some even have gone as far as making obscene commentary on AIM and other websites under the assumption that they will never be found out, but Kitsune always somehow manages to find out from other MFGGers about the negative talks going on behind his back. Kitsune has several finished, in-progress, and canned projects under his belt. Here are just a few. Luigi in...Koopa Kombat! - A remake of one of Kitsune's old games, revered for its old-school gameplay style. Yet another remake, Luigi and Friends...in Koopa Kombat Deluxe! has been slated for release, but the due date is presently unknown. Mario Soccer - Originally started as a minigame for the third MFGG Minigame Competition (and won gold), he has expanded into a game with 20 stages, each with its own gimmicks. In essence, the main body of the game has been completed, but Kitsune has yet to bring himself to finish this, as much as he wants to. RyuFox Fighters - This project took most of the MFGG community by storm with its fast-paced action and near flawless engine. The only real major complaints rested on the frequency of the appearance of items and the lack of anything really innovative in the engine. There have been several offshoots of this, including the MFGG RyuFox Fighters game projects. Only four have been completed (Delichan vs. Hanyou, Luigifan vs. Hanyou, Luigifan vs. Hanyou Luigifan Clones Event Match, and Hanyou vs. Kitsune). A fifth, Msonic vs. Delichan, was never finished, but still sits on Kitsune's computer. The present RyuFox Fighters engine is a heavy remake of the original made back in late 1999. This iteration of the engine came after the release of the Mario vs. Sonic demo, which also made waves on MFGG. Mario vs. Sonic - Based on RyuFox Fighters, Mario vs. Sonic was homage to the age old "Who's better?" battle between Nintendo's flagman Mario and SEGA's poster boy Sonic the Hedgehog. The engine is not nearly as polished as RyuFox Fighters, but had more in terms of gameplay. Players could collect several items from either the Mario or Sonic universes to aid them in their fights. 1-up Mushrooms restored health, Rings allowed characters to pull off super moves, Coins, gems, and other small monetary items served as scoring items, Starmen could be used to make players invincible, and 7 Chaos Emeralds allowed players to don a shield that reflected any any projectile attack and injure offending players. RyuFox Legends - This was started back in 2004 as a series of scripts, then hand-drawn webcomics in 2005. The comics were well-received on MFGG, despite Kitsune's lack of confidence in his artwork at the time. A year later in 2006, during a sabbatical from school, Kitsune began working on a reiteration of the two episodes on the web, as well as the next two that followed. The news soon spread around MFGG that his intent was to publish them as a series of graphic novels or manga. He refuses to call it the latter, as he is still convinced his work isn't worthy of the title. Despite this belief, everyone who has read RyuFox Legends Volume 1 has regarded it very highly, praising the artwork, the storyline, and in many cases, both. Volume 2 is currently in production with no set release date. Current progress on the series can be found on the RyuFox Legends Website. Shortly after publishing RyuFox Legends, Kitsune decided it was time for a change. As he was now a published author, he needed an avatar character representative of his human self, hence the creation of Nicholas Ainsworth. Not long after, he was elected as one of two comment mods for the MFGG mainsite (the other being Tragic). He currently runs his own forum, Kannagi Stadium, which acts as a hub for his other two websites, Goshi-Dan's Arcade and the RyuFox Legends Website. This forum is no longer particularly active, however. He recently found a girlfriend as well, so projects revolving around her take up most of his time outside of school and his websites. Despite school and issues at home being extremely problematic for him, he's still pushing forward on his art projects. RyuFox Legends Volume 2 is currently in production, as well as another soon-to-be-revealed literary project, a light novel. Despite his name changes, many members still refer to him as Kitsune, as most of his impact on MFGG was made under that alias. This page was last edited on 8 December 2016, at 05:38.